As the world is in an earnest expectation at the moment awaiting the court case sitting in ECOWAS Community court between Mazi Nnamdi Kanu (De Great) and Federal Government of Nigeria come May 18, 2017. One question which is hitting every corner of the universe at moment is "will there be anything again that will hinder ECOWAS Court from giving Mazi Nnamdi Kanu, the justice which he sought for in the court since March 3, 2016"? People all over the world should not forget that Mazi Nnamdi Kanu, the supreme leader of Indigenous People of Biafra (IPOB) Worldwide instituted a case against Nigerian government in March 3, 2016 in ECOWAS court over the refusal of Nigerian government to release him unconditionally as Nigeria Federal High court Abuja, presided over by Hon Justice Adeniyi Ademola ruled in December 17, 2015, which amounts to violation of his fundamental human rights. It is important to make ECOWAS court to know that Nigerian government has not obeyed the court ruling till today, and did not also appeal the ruling of December 17, 2015 in any appellate court till today which means that the violation of fundamental human rights of Mazi Nnamdi Kanu still continues since the March 3, 2016 when he brought his suit before ECOWAS court till today. Has ECOWAS Court not given Nigerian government enough time to provide substantive reasons why it refused to release Nnamdi Kanu from December 17, 2015 when the court ruling for his unconditional release was given till March 3, 2016 when he took his case to ECOWAS court? Should ECOWAS court take any other step apart from giving verdict on the case come May 18, 2017, let it be known to the world that ECOWAS Court has stampeded justice, perverted justice and thwarted justice against the oppressed (Nnamdi Kanu) in order to satisfy the ungodly yearning of political bubble in ECOWAS sub-region, when a temple of Justice should rather be too big to be sacrificed to protect such obnoxious political bubble. If an ordinary case of human rights abuse between a citizen of ECOWAS and a member state of ECOWAS sub-region will take up to 15 Calendar months now to be decided and be ruled upon in ECOWAS court, I now begin to wonder and doubt the capability of ECOWAS court to handle a high profile case that could bother on international or bilateral relations of member states of the sub-region should such type of complicated and high profile case hit the court. ECOWAS court has done adjournments upon adjournments, rescheduling of date of court sitting upon rescheduling in this simple case of a glaring human rights violation in a way of buying time for Nigerian government to the detriment of justice which every court stand to protect in a shameful way that has reached its cresendo. It is upon this ground that I hereby ask ECOWAS court, is there any other excuse on why justice will not be given to Nnamdi Kanu so that the battered image of ECOWAS court could be purged away and restore confidence of the citizens of ECOWAS sub-region on the court? There should be no pressure or lure of political bubble in the sub-region that supposed to influence the decisions of the court in any case at a given time so that the sub-region will not be thrown into a large enclave of impunity, lawlessness and anarchy. However, come May 18, 2017, the world will be expecting nothing but the verdict of the case because the expectation of the deserved justice is already long overdue. 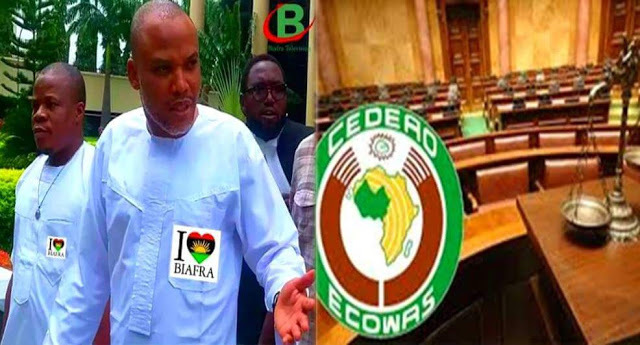 Further adjournment will bring mockery to ECOWAS court and justify the allegation of the observers that the court is apparently denying Nnamdi Kanu his due justice. A word is enough for the wise!